Hanoi (VNA) – Cabinet members sought ways for achieving an economic growth target of 6.3-6.5 percent in 2016 during the second working day of the Government’s monthly meeting in Hanoi on October 4. According to the Ministry of Planning and Investment, the macro economy remained stable and inflation was tamed in the first nine months of this year. The national consumer price index (CPI) in September increased by 0.54 percent month-on-month and 3.14 percent against December 2015, the ministry said. Of note, the country’s gross domestic product (GDP) in the January-September period grew 5.93 percent thanks to a hike of 6.4 percent recorded in the third quarter. More than 81,450 businesses were established in the reviewed period with accumulated capital of over 629 trillion VND (28.3 billion USD), up 19 percent in the number of enterprises and 50 percent in capital investment. To reach the growth rate of 6.5 percent, it is a must to generate a 7.7 percent increase in the last quarter, which requires greater efforts of agencies and localities, the ministry said. It predicted that the domestic purchasing power as well as the tourism and farming sectors will be upbeat in the last three months. 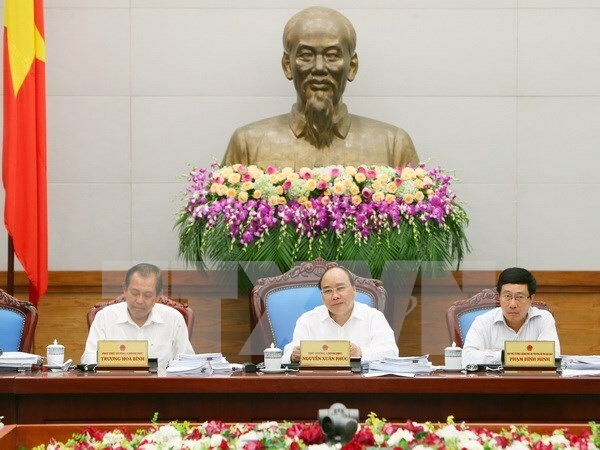 Commenting on the country’s socio-economic situation, Prime Minister Nguyen Xuan Phuc said the Cabinet members, sectors and localities have endeavored to unlock hindrances to production and businesses and adopt a lot of policies to be welcomed by businesses and people. “The GDP growth rate goal of 6.3-6.5 percent is a huge request, requiring more drastic solutions from the Government, sectors and branches,” he said. He then urged each Cabinet member to do more to create stronger changes in tackling bad debts, public debts, weak credit organisations, loss-struggling State enterprises, and stagnancy in State-invested construction. In 2017 and the first year of any working term, each ministry and each sector needs to craft its action plan which should identify precisely challenges and causes and have solutions to making breakthroughs in its assigned field, he noted. Regarding the management of public assets, he assigned the Ministry of Finance to work on a model to manage the assets in line with the market rules. The State Bank of Vietnam should study measures to deal with credit organisations which are posing a threat to the health of the banking system following the market principles, he said. The restructuring of the State-owned enterprises should be sped up and the divestment of State companies must ensure transparency to bring the maximal benefit for the State, he stressed. He requested ministries and sectors not raise electricity price while adjusting the prices of essential commodities and healthcare services appropriately. The leader asked relevant agencies in the finance and budget fields to work harder to manage overdue tax below 5 percent of the tax collection in 2015, together with combating tax evasion. Ministries and localities should quickly deploy the payment of compensation for those who were affected by the maritime environment incident in Ha Tinh, Quang Binh, Quang Tri, and ThuaThien-Hue provinces. For exports, he requested all ministries, in particularly the Ministry of Industry and Trade to review export measures, manage trade deficit and exploit the domestic market maximally.